Whatever job you are doing, is it always nice to receive recognition of your hard work an achievements. This may come in the form of verbal praise, written acknowledgment, a pay increase or an award. Whatever it is, it can be great boost to your self esteem and to your career. As an apprentice, who is still quite new to the industry, winning an award can make you stand out from the crowd. Work hard, make sure people know about what you are doing and be proactive in applying for awards or telling your employer about your achievements within the company. Many companies have employee rewards in place that recognise the hard work and achievements of their staff. 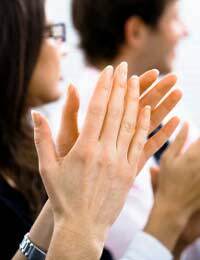 These give employees the impetus to be recognised and show that the employer cares about what they are doing. As an apprentice there is no reason why you can’t earn these, find out what is on offer and what you need to do to be in the running. Then make sure that your manager knows about the work that you are doing and that have a record of all you progress. The Learning and Skills council, who oversee all apprenticeships, run an annual apprenticeship award scheme. These awards recognise the skills and achievements of apprentices and how they have helped their company. To be in the running you should have made a significant contribution to your company by having a new idea, improving procedure or making some other big impact. The Learning and Skills council also offer awards for employers. Putting forward your company can be a good way to recognise what they have done for you. Your company should be able to show increased productivity through employing apprentices, a great training plan and a vision for the future. Although this award doesn’t benefit you directly, it is always good to show that you have been part of a successful company. It doesn’t just need to be awards that reward you hard work and achievements. Sometimes it can be just as good for your employer to recognise what you have been doing. This may be a verbal recognition, a written record or an increase in pay that reflects your progress. Whatever it is, make sure there is a permanent record of it so that you can use it in the future. If you feel that you are not getting the recognition that you deserve then talk to your manager to find out what else you could be doing. Whether is an internal or external awards, a pay rise or just a recognition of you hard work, it is also a great feeling to get a reward for what you have done. Do your best and make sure that people are aware of it. Keep a record of any major contributions or the impact that you have on the company. If you do win an award or receive recognitions then keep a permanent note of it so you can refer to it in the future. Hi my daughter has been doing an Apprenticeship at Enki bathroom in Stalybridge. This is her second time at Enki bathroom. The first time he got rid of her he said they couldn't afford to keep her on. On Friday they got rid of her again,this time the reason was `they were making changes to the shop`. Her employer rang Aspire on Friday and spoke to someone called Terry. She has only got 2 weeks left of her Apprenticeship. Can he just get rid of her like this without no genuine reason? Has my daughter got a case for unfair dismissal? @pagey - have you had a word with your son's boss? Is he aware of his aspergers? I loathe this sort of treatment and inverted bullying with people picking on others because they sense a vulnerability (this is what it sounds like to me). You need to broach it with your boss first and try to sort it out informally. If the treatment continues and it has not been resolved, then you could bring about an official grievance. my son of 17 has aspergers , 6 months ago he started an apprenticeship, a person there is playing mind games with himto the point where hes putting himself in danger because this person moans if my son asks for help, his boss has no backbone and will not step up, where do we go for help? When my daughter began her apprenticeship it was in the nursery at a local school. She decided on this particular school because she wants to eventually open her own nursery and other offers were with older children. Twelve months in to an 18 mth apprenticeship she was moved to year 3. After explaining that this was not where she wanted to be and that all her course work was based on the younger children she was told she works for the school and can be based where ever the head feels she is needed. Another member of staff has since been employed to replace her in the nursery. My daughter's apprenticeship runs out on the 22nd of this mth and today she was told she will be kept on but only at 10 hrs per when previously it was 30. If she had been allowed to stay in the nursery she would still be needed for 30 hrs. Is there anything we can do about this, does she have any rights or is that it because her apprenticeship has ended?